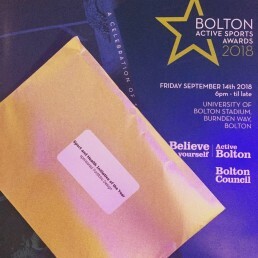 We had the honour of presenting an award at Bolton Active Sports Awards on September 14th 2018. It was the award for Sports and Health Initiative of the Year. We have sponsored the sports awards for the past three years and designed the brand, brochure, videos and an array of other things to ensure that the 2018 look of the awards was fresh and looking good. Promoting being active is something that our Creative Director Darren is extremely passionate about and we love getting involved in all things which encourage keeping active, getting fitter and general health and wellbeing. 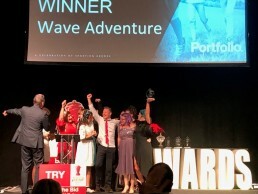 Well done to WAVE Adventure, the winners, who organise outdoor activities for children and young people who wouldn’t usually get the chance to take part. Their main aims are to increase self-esteem, improve health and encourage the ability to form positive relationships. Thanks to our guests, you were great company and a huge thank you too to Iwan Thomas for being so approachable and generous with his time. 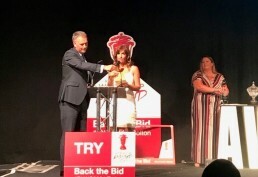 It was a brilliant night celebrating fantastic Bolton people and initiatives!